I don’t normally write about heavy topics on my blog. I try to keep it light and cheery and fun but occasionally something moves me quite deeply and I feel I have to share it regardless of whether it breaks the norm of my posting cycle. Today I’d like to express my viewpoint on witchcraft and magic in general. My reasons for this are two-fold. One, to raise awareness of what witchcraft actually is and it’s involvement in trafficking and two, to explain my viewpoint on the subject based on my own personal experiences with magic and the people involved in that world. I’ll start with it’s involvement in trafficking as that is the least biased of the viewpoint. Trafficking is one of the biggest crimes in the world currently with an estimated 27 million women, children and men in some form of slavery. This slavery can vary from sexual exploitation, to slave labour, to uses in witchcraft. Wondering what this has to do with witchcraft? Well there was a brilliant article written recently by the bbc about trafficking and what often happens to the children taken from Africa. Children are put through rituals by local witch-doctors to frighten and intimidate them into believing that they can’t tell the authorities about what’s going to happen to them or they and their families will die. While it’s debatable whether this is really witchcraft, it’s still being used to control and manipulate. This still doesn’t explain how it’s a problem in this country so for that I need to refer to another bbc news report which explains how children are brought to the UK to provide the human blood needed for certain witchcraft practices. The reporter visited 10 different witch doctors and spiritual healers in the UK and 2 of them offered him human blood that they already had collected. And Not just a small amount either, it was in a container that looked like it held over a pint of human blood. The report also states that belief in the UK in spiritual healing and all manner of magical ways to heal people is on the increase. In my experience I’d actually beg to refute this, I think it’s something that’s always been largely in the UK culture, I just think it’s more acceptable to talk about it now. This brings me to my personal experiences. I can’t actually say everything but I actually know at least two practising druids (as they call themselves), one of which is second in charge of one of the biggest witchcraft cults in the UK. We’re talking thousands and thousands of people across the country. Both of these two people, have on several occasions tried to get me involved, from a very early age I might add. The things these people do is not something to be taken lightly. There may well be people who dip into it and experiment with the healing parts and the meditation but underneath all that there is a culture, based on fear, manipulation and control that regularly involves rituals and spells that are actually illegal and often very dangerous. You only have to read the few published books by Freemasons that have walked away from the upper circles to get an idea of some of the things they do. Finally, I’ve actually dabbled in it myself. I took to it naturally, with good skills at predicting the future especially, mostly tarot reading. It’s a much bigger background thing in the UK than most people expect it to be and know about and I’ve never seen any good come from it. I was so badly affected by my few months trial that it took me many years to fully walk away from it. This is why I don’t like witchcraft, magic or anything to do with it. Trafficking is sick and using magic and the fear of it to control people is wrong on so many levels. Controlling people and sapping money from them because they are being mislead by magic and spirituality is also wrong. Therefore I will not encourage any use of it or anything else that makes it look good when it’s not. Currently I am working on book one of the Heritage series called Elsa. Elsa takes place in 1904 Marion, Ohio. The series is loosely based on the life of my great-great grandmother. Franklin Thaddaus Raymond plans to marry Elsa Beatrice Russell but must do so before his fiancee arrives back in Ohio. Elsa doesn’t know Franklin has a fiancee. The young couple must overcome several obstacles including family secrets, medical issues and Franklin’s secret life. Will Elsa ever learn the truth? A truth that could tear her young marriage apart or make it stronger. A prophecy has been cast against her. In a harsh world deep within the western frontier of Ohio and Kentucky, Calico Marie Turner must learn to survive among the Shawnee and the trust the one man who hates her the most, Chief Little Owl Quick as the Wind. The Children of the Shawnee series traces the lives of twin sisters, Rose and Calico. Books 1, 3, and 5 tell Calico’s story. Books 2,4,and 6 tell Rose’s side of the story. Calico’s portion takes place with the Shawnee Native Americans and traces the struggles they faced. Rose is raised in France as a Madame Royale, the first princess of the dauphin, Louis Ferdinad de France. She is rasied next to Louis Auguste who eventualy marries Marie Antoinette. You’ve set a lot of your books in Ohio so far but in the past, is that because of family links or do you have other reasons to favour Ohio as your setting? I have found much of my fodder for books through my family connections in Ohio. I am a direct descendant from one of the first families that settled in Ohio before it was a state. When I was a child, I was fascinated by the family stories my mother and grandparents use to tell me. I began to conduct genealogical research on my mother’s side of the family when I was nine years old. My research has never ended. I continue to discover new and interesting stories about my family. One of the family stories had provided the inspiration for my new series, Heritage. I love to write historical fiction, paranormal and women’s fiction. I tend to read adventure, historical fiction, paranoramal. My speciality is in Native American history and culture. You like reading Woman’s fiction but don’t like writing it, is there a particular reason? My novels have always had strong female leads. I do place romance scenes in them but try not to stress them. I do this because I want the focus to be on my heroine’s journey. My female leads often struggle with family or personal issues. I want my readers to see a situation, whether historical or not, through the eyes of a female. Often history is written from a male’s perspective. I strive to challenge my readers to see history through the female’s point of view. “Calico” is a good example of this. Society has always heard about the Shawnee female captives, how they were mistreated and tried to run away. In Calico, I strive to show my readers not all white women were captives. There are historical records of women who, after they were rescued from captivity, ran back to the Shawnee. Why? Because women who had lived with Shawnee had more freedoms than they did living in 18th or 19th century white society. In “Calico”, Calico is refuses to be rescued by Daniel Boone and his colleague. She tells them she is not a captive. Society also forgets not all white women were captives. The daughters of the French fur traders intermarried with the Shawnee all the time. Would you still write if there was no financial need to, and if not what would you do instead? Absolutely. Writing is my passion. Which do you prefer, paper books or ebooks and why? Paper books. I love to feel a book in my hand. I plan to keep on writing. My husband and I are buying a Victorian home that was built in 1882. We plan to renovate it and turn it into a Bed and Breakfast. We also want to open up a bookstore/gift shop. I am also the executive director of the Kentucky Young Writers Connection. I love teaching children and adults how to express themselves within the written word. The publishing world is changing all around us and I think new authors need to know how to navigate in that world. Is there some advice you’d like to give other new authors about your journey so far? Never pay to have your work published and never pay for an agent. If you are writing historical ficiton, get out there and dig deep in your research. Try to see life through the eyes of your character. Not all characters are going to see the same event the same way nor are they gong to react the same. With the first novel of mine finally finished and in print I thought I’d share the timeline of how things went in writing it. This is also my 100th blog and I figured a nice way to mark me actually being relatively successful at blogging. I then wrote the first 600 words or so in a frenzy of writing delight. I hadn’t written in well over a year and it felt very good. I vowed then and there that I would finish the book. I uploaded a polished version of the first 600 words or so to the Wiki page for the society of the MMO I’m playing (puzzle pirates, yes I still play). I got 5 people in the society reading it, including the friend that sparked it. Over the next month I wrote and uploaded 4 more chunks of approx 600 words each. I realised I had totally forgotten about the book again and needed to continue. I wrote another 2k words that month. I also attended a writers meeting and took what I had along. It’s the first time my husband took me wanting to write seriously. It’s was also the first time I really begin to take it seriously. I was bored and didn’t know what to do while waiting for Christmas to come so I wrote some more, bringing the total up to approx 7k words. I also told the first few other people that I was considering writing as a career. I’d finally realised I loved writing even if I didn’t understand what that meant. I started to take the book more seriously as a whole and renamed a bunch of characters as well as rewrote some really bad chunks. I also finally plotted out the rest of the book chapter by chapter. I handed my notice in at my job, wanting a less stressful one with less hours so I could spend more time writing. I started temping in various locations, writing in between short term temp jobs. By the end of September I had got approx 20k words done and was introducing myself as a writer to people I met. I still attended any of the writers meet ups I can in Bath. I also made my first estimate on the final book count, around 70k words. I finally got a part time job and settled into a writing routine. Writing approximately 2k words per week on a good week and about 500 on a bad. I really wasn’t very disciplined but I was making progress. I had about 35k words and felt like half way there. At this point I started researching publishing options from the traditional way, to Print on demand, to completely self funding a print run. I decided I didn’t really like any of them that much which was typical me really. I always want to change a revolutionise things. I did have a natural leaning towards print on demand though. I didn’t like the gatekeeper mentality of the traditional route and I couldn’t afford to fund a print run large enough to make it worth doing. Unfortunately I also couldn’t find a Print on demand service that didn’t charge a huge amount for not a lot of actual gain. I had my first meeting with a guy called Chris Turner because I’d seen a film trailer idea of his on facebook and offered to help him write the script. I’d only met him once before at a wedding we had both helped at and I’m not entirely sure why I offered to help him, I just couldn’t stop myself. We then meet up at least once a week for the next 4 months which seriously cuts into my writing time because I typed up what we hand wrote together. I managed to scrape together enough money to stop working completely and live off my very lovely husband for a few months. He was by now very aware I was 100% sure not only do I want to be a writer but I wanted to be a entrepreneur of sorts. I still didn’t get any more writing done on my book, however, as I was too busy trying to raise money for the new company I’d set up with Chris and get my head around my new role. Somehow my money was still lasting and I still didn’t have to go back to work so I turned my full time attention back to the book I promised myself I would finish 2.5 years earlier. At this point I still didn’t really know what I was doing. I just knew I wanted to be creative and write. I filled up my first A4 pad of hand written book (I don’t work well typing straight away) and moved on to my second, feeling very very satisfied with myself. I had about 55k words at this point and realised it was going to be a good bit longer than 70k words, more like 85k in total. I promised myself it would be finished before the end of the year. I finished the first draft of the book. It had a temporary title – All’s fair in love and war. I kinda liked it but not enough to keep it. It’s 88k words long. I also only had 15 minutes until the new year’s eve party I was hosting started. Needless to say I hit party mode full swing (I worked on Christmas day to get it finished). I emailed it out to three beta readers after having a preliminary edit myself. Over the next 6 months it got edited a total of 4 times and had a lot added and taken out. I finally felt I’d finished enough for my liking. I got back to researching ways to publish. Because I didn’t have the money for any of the other options I knew about I eventually decide on traditional publishing and went through the agonies of writing a synopsis of several different lengths as well as a query letter and email. I’d finally picked some publishers I wanted to apply to and finished fretting about my query letters etc. I applied to one by email only putting in a two sentence synopsis as they asked, nothing else. I got rejected. I found I didn’t actually care that much. I mean I know it’s not nice being rejected and I was angry they didn’t even bother to read a longer synopsis or even look at the book at all but I’m not actually that bothered. I used the rejection as an excuse to get people to stop nagging me to apply to more publishers until I could figure out what I did really want. I think a lot of friends and family were a little fed up with me at this point. It had been ages since I’d started and I often had people asking leading questions about the book. To be fair I was equally as fed up. I couldn’t find the option I wanted and didn’t think it existed. Someone online overheard me telling someone else I was trying to get published and asked why I didn’t try self publishing on kindle as an ebook. I vaguely remembered hearing of the Kindle but I dismissed the idea as not being good enough. I couldn’t sleep. What I was told about ebooks kept coming back to me. I googled them and found several blogs and articles by people saying ebooks are revolutionising the way the world reads and even some traditionally published authors are now self publishing to kindle. Mostly Joe Konrath. I hashed this over with several people. Some I knew would say ‘no, go traditional’ others I thought would go for the ebook thing and some I thought wouldn’t give an opinion. Surprisingly all but one said go for it. I spend two days thinking about and researching nothing else, trying to decide what I wanted to do. I didn’t like what the traditional publishing industry is, never had and really didn’t feel settled or happy applying to them. I also didn’t want to just self publish something that was rubbish and add to the stereotype that self published authors are crap and not worth considering. Eventually my heart over ruled my head and I went with what I felt most peaceful about. Ebook publishing for the win. I did know I needed to really make sure my book was up to scratch so I made a short list of people I wanted to help me get the book edited. I couldn’t afford a professional copy edit as at this point I’d been out of work for over 15 months. Fortunately I had a list of 2 other writers, someone that used to edit for a magazine, and a few good friends with a good eye for detail. In some cases I had a volunteer or two ask to help out proof reading and I thought more couldn’t hurt. I also made a request to an artist I knew for a front cover. The provisional launch date I had in my head was December 1st although the few people I said this to all laughed at me. They thought it was going to take me until the following year at the earliest. All the editing was finished and done and I sat and waited for all the cover art I needed as well as got my book formatted correctly for the kindle. I found out my front cover art wasn’t going well. I quickly emailed or facebooked every person I knew who was a graphic artist of any kind and asked them if they had the time and expertise I needed. Keith Mountifield stepped in and we worked until almost midnight together making my ebook cover design. I got up early to upload everything and finally hit the publish button. The formatting was awful and needed to be completely re-hauled. I started totally over, stripping the book of all its formatting and reapplying all of it again. By 4pm I’d managed it. The book was launched as an ebook. I marketed the book like crazy. Trying to get reviews from review blogs as well as customer reviews. Lots of people wouldn’t review it because it was either an ebook only or self published. I had to admit I got very annoyed about this but persevered anyway. Cost so far £7.75 (sending printed manuscript to a reviewer, who then never reviewed it). I started working with Keith Mountifield on a website to help promote the book and the other stuff I was doing by then. Tony Mountifield kindly agreed to host it for me. (I love my in-laws, they are a very talented bunch of people) Cost so far £19.75 (registering domain name). Website was up and running, despite me having no internet for over 24 hours in between starting and finishing. I researched ebook tips on marketing and getting reviews and it brought me back to Joe Konrath’s blog. The days blog was about his print books and how he prints them through a subsidiary company of Amazon.com – CreateSpace. I registered that he printed his books himself but thought nothing more of it, instead I looked for advice on how to maximise ebook sales. I couldn’t sleep again. I kept thinking about print books and Createspace. I had to check it out. I suddenly realised, not only are they the perfect Print on Demand company to go alongside my ebook choice but they didn’t charge (you can pay $39 for a higher chunk of royalties if you wish, but don’t have to). They were just what I had been looking for over 2 years ago. I then told a bunch of people. Including Keith Mountifield, who would be my person of choice for making the front cover, spine, and back cover (seriously this guy rocks). We talked about the things I’d need to do a much higher quality cover for a printed book and he gave me a list of things I’d have to get. I blogged a giveaway and began trying to get everything I needed. Lots of people helped. I also reformatted the book for print, deciding on a 5.5′ by 8.5′ book with 274 pages. I had my first completely independent 5 star review of the book from the Founder of the ePublishing Consortium. I was over the moon with this as it was the first person that didn’t know me in some way who had given me a 5 star. It also got me included on the reviewers Amazon list that was just for the top Indie books in his opinion. I then had many more reviews roll in over the next few weeks. The ebook was on promotion for the rest of the month at only 99 cents to help raise awareness. I had more sales during this period than the rest of the year to that date and was only 1 off doubling my total lifetime sales for the book. I decided to keep the price at 99 cents as an ebook as it kept sales at a slightly higher level than at $2.99, also had a few more 5 star reviews roll in. I uploaded everything needed to Createspace. Had the files rejected. Tried again. Got rejected because of the bleed not being obviously there. I then swapped a few messages with the Createspace support team and with Keith trying to figure out why it wasn’t working. Took a break from trying to figure out the files issues to focus on other stuff and have a holiday. Continued trying Createspace’s review process, encountering many different problems after reformatting and reediting. A lot of it didn’t really make sense. Keith eventually redid the whole cover again in a different program. The first box of my books arrived and I began signing. I know this dates in the future but it’s when I’ve actually scheduled my book launch for. It’s going to be in the Starbucks on Bond Street in bath and anyone is welcome to join from 1pm onwards. And that’s the whole journey. Well done to anyone who actually read the whole thing and made it all the way to the bottom here. So I reach update 2 and find myself with only 4000 words to go of the massive 50,000 word total. The writing since my last update has been relatively uneventful. My original plot has been so forgotten I don’t really know what’s happening next in my book but that’s not really that unusual. Once I’ve finished this next 4k I’ll sit down and re-evaluate where it’s all going. Despite the high chance of me hitting 50,000 way before the end of the month I don’t really expect to get much more done. It seems my last few days of November are so full of wedding related things like Hen nights and bridesmaids dress fittings and then the few Christmassy things on to that other than the rest of this week I’m not going to get much opportunity to add to the total. But back to my beloved characters. Anya turned out to be a little more gutsy than I imagined her. Seems the first few chapters helped her grow some inner strength and Sherdan softened a little but only a very little. I’ve got countless semi named characters whose names are bound to change a few times in editing and a country I’ve still not properly named. I don’t really like naming under pressure. For my first attempt at NaNoWriMo I’m pretty happy with how things have gone. It’s been harder lately than it was at the start of the month though. I really think I need to get some kind of tablet with handwriting recognition software. The typing up is a complete pain. I love films with music in them, well kinda, I love disney films mostly, I don’t actually like most traditional style musicals. They are often a little cheesy for me. I do love music though and a well told story. Therefore I was pretty convinced I would like The Phantom Of The Opera. I have never had the good fortune to see it in the theatre so I saw the movie version made in 2004. I had no idea of the cast before I saw it so I was extremely surprised when Gerard Butlers name appeared. I spent the next half an hour trying to figure out who he was, I didn’t twig for ages that he was the gorgeous Phantom, singing all those gorgeous notes and perfectly suggestive lines. Gerard Butler was the phantom! This was the same guy I’d seen in Tomb Raider as Terry Sheridan. I spent the next half an hour totally absorbed in how different a performance he was giving. Naturally I had to watch the film again. I can’t exactly give a fair review of a film when I’ve spent over half of it focused entirely on Gerard Butler. With the second watching I focused more on the film as a whole. There was a lot of detail to take in, in both the music and the scenes. Often the scenes within the opera house were busy and full of background stage people beautifully choreographed. Every little detail seemed well thought of, which was a relief when you notice that on the front cover of the dvd case the phantom’s mask is on the wrong side, (how did they miss that one?) which is not a great first impression. Christine and The Phantom had an amazing amount of chemistry, the passion between them was evident and along with the music, very compelling. Both actors deserve credit for what they pulled off, the music and acting were both superb. Raoul was my sticking point. I couldn’t decide if I just didn’t like the actor and his slightly creepy smile and laugh or if it was just because he was not meant to be my prefered choice. I didn’t really like him though. I actually found myself wanting the Phantom to win Christine even though he was going about it in the wrong way. Now don’t get me wrong, Raoul was the knight in shining armour he was meant to be. He pursued The Phantom at every opportunity and did his best to protect Christine when he realised she was in danger. The trouble was, until about two thirds of the way through the film, he didn’t even believe Christine that the Phantom was any more than a myth or something in her head. He even laughs at her at several points for trying to persuade him that the Phantom existed. It was almost like he didn’t actually care about Christine he just cared that someone else was after something he wanted. He even asks her to put herself in danger so he can catch and punish the Phantom when to keep her safe all he has to do is marry her and take her home. He asks his future wife to risk her life so he can get revenge! I just couldn’t believe he actually loved her. With that aside the film was amazing, the music was awesome, the singing divine and the details lovingly perfected. It really was an amazing work of art and I’m really hoping to go see the stage version some time soon. Our intrepid Interviewee is Kat Brooks today. My two newest books were released in the same week back in August. I definitely didn’t plan it that way! One is “Mr. Pish’s Woodland Adventure,” which follows the adventurous Jack Russell Terrier – Mr. Pish – on an expedition through the forest. It’s all full-color photography and information presented in a fun way to get kids (and adults) interested in exploring what’s outside their doors. It’s the third book in my series promoting Outdoor Learning and Literacy. My other book is “Night Undone,” a character-driven suspense drama featuring the recurring anti-terrorist Special Agent Kathrin Night. It’s the second book in the “Cover Me” series which features Agent Night after her career-ending injury. She now has to deal with forced retirement, a real relationship, and figuring out how to get back into the industry she was born to be in – covert ops. Writing books for children and writing about anti-terrorist Special Agents are obviously two very different genre’s of book, do you enjoy writing such differing subject matters or find it difficult to balance the two? I started out writing action-adventure thrillers. The research and writing mindset is intense. I welcome the lightness of the children’s books, and the opportunity to showcase my photography. It’s a gentle, happy creative process, which is a great break from the dark world of an incredibly serious single-sighted Special Agent. I write in marathons. I get in a mindset and I go. Nothing else gets done when I’m doing that. Your writing seems like it can be quite sporadic, do you find it difficult writing to deadlines or just don’t set yourself any? I give myself ridiculous deadlines. I’m trying to turn out at least 2 published books a year. The only reason I stop writing is to do the marketing after a book is released. I’m almost done with 1 other children’s book, and I was hoping to finish my action-adventure thriller as well – which would have given me 4 this year. Frankly I’m disappointed with myself because I probably won’t get all 4 in print this year. Are there any of your characters you particularly relate to, if there is, who and why? Oddly enough, no, I don’t really relate to any of my published characters. They’ve morphed into something more than me. I share some of their same basic beliefs, but the similarities end there. I’ve been working on a vampire novel on and off for about 14 years now (ugh, I didn’t realize it was that long until right now) – and honestly – I relate to that main character more than any of my others. Which is kind of a frightening thought. A perfect writing day would go like this: Wake up – instantly, the writing in my head begins. It’s actually more like it never stopped – I was just asleep while it was going on without my knowledge. Have coffee – write on the laptop. Don’t stop writing until I walk the dog (Mr. Pish), during which time I’m writing in my head. Back to the laptop…write until I need to stretch, only stopping momentarily here and there to take Mr. Pish out and get a glass of water or tea. Make and eat breakfast, lunch and dinner while writing in my head. Write on the laptop until I’m exhausted, go to bed, write in my head while I’m falling asleep. Wake up in the middle of the night writing in my head. This would all be COMPLETELY perfect if there was a staff available to do the cooking and cleaning. I’d still want to walk Mr. Pish. I’m working on the sequels to “Postcards from Mr. Pish,” “Mr. Pish’s Woodland Adventure,” “Lust for Danger,” and “Night Undone.” I’ve got an anthology that I wrote with Author Newton Love that we’re marketing to publishers, and I’ve got that vampire novel started, along with a couple of other projects on the backburner. There are always at least 4 books being written in my head at any one time. Good thing I’m ADHD. You say you’ve written with another author, did you work on the same story/stories together or just put together a collection of stories you’d written separately? It’s a collection of stories, poetry and flash fiction that we’d written separately. We’re currently shopping it around to e-book publishers. Was working with another author a good experience and one you would like to repeat? Newt is a great guy to work with, and he’s a great author, so it was a wonderful experience. I’d do it again in a heartbeat…with Newt. I’ve had some bad experiences with other writers – people blatantly plaigiarizing me – so there’s a big trust hurdle that needs to be overcome before I could work on a project with someone else. I’m lucky to know Newt, and I’d say to other writers if you have someone talented and trustworthy like Newt who you can bounce ideas off of and collaborate with – hold onto that person and make sure you let them know how much you appreciate them! If you’d like to find out more about Kat, you can visit her website or follow her on facebook and twitter, likewise for more info on Mr. Pish, you can visit his website or follow him on facebook or twitter. For more info on the books you can visit the Amazon author page here. One of the biggest challenges every writer faces is editing. No writer really likes doing it. It’s essentially finding everything that’s wrong with the masterpiece you just laboured over. I’ve blogged before on some of the best ways to edit and you can find that blog here. What I’d like to talk about today is some common things that need to be looked for when editing. One of my most common mistakes and one I hear other authors talking about is the over use of the word ‘that’. It’s used a lot in speaking but in the written word it’s often not needed. For example the sentence, ‘He told her all of the things that he needed’ works just as well if said, ‘He told her all of the things he needed’ so often doing a find all on the word ‘that’ and removing most of them is a good way to start. Do be aware some uses of the word are necessary, so don’t just do a find and replace. Another common mistake is the overuse of the character’s names. Often he, she, him and her are enough when there is only two or less characters present. The name can be used again here and there but it doesn’t have to be every paragraph. Then there is the spelling ones that don’t get picked up by spell checker, for example using the wrong one of their, there, and they’re. As long as you’ve spelt them right then it’s not going to get flagged up as wrong. The one I always do wrong is it’s and its, they are the opposite way round to my expectations and I can never remember which one I should be using. It’s is the shortened form of it is and its is when there is a posession and the owner is refered to as it. For example if you were refering to a ship’s sails you might say ‘its sails’, not ‘it’s sails’. The words ‘begin’ and ‘start’ are used a lot in writing as well. They’re not so useful and in almost all cases can be cut out of work. The only time I’d use them is when there is a list of things the person has got to do and they ‘get started on their chores’ for example. It’s the same with ‘then’. It should really only be used in a list of things the person is doing, not as the start to a new sentence or paragraph. There are a few others but they are the ones I find most often in my own work. I’m getting into the habit of not using them in the first place or using them correctly to begin with but occasionally they still creep into my work where they are not wanted. So far NaNoWriMo is going very well for me, I’m around the 30k mark for words and not even half way through the month. I’m also getting a good handle on the actual plot length now, even if I’ve not stuck that well to my plot notes. Thankfully all the research I did before has paid off and it’s been light work. There was one point I got stuck but thankfully adding a little snow and letting my characters frolick for ten minutes seemed to unstick the situation and moved the plot on nicely. Let’s face it who doesn’t like snow angels? I’m falling even more in love with Anya and improving Sherdan so I’m quite in anger of loving him too. I’ve already laughed at my characters and come very close to tears on several points during writing. It’s a lot darker than I intended but actually so far I think it’s a good thing. Sometimes the light seems all the brighter for darkness before hand. Either way you’ll be able to decide for yourselves soon. I am hoping to get the first chapter polished up nicely and it will hopefully be one of my first blogs in December. Anyway time for me to get back to my writing. Good luck everyone else NaNoing this month. I recently blogged about this book and now I’ve finally finished reading it. If you have any contact with a creative person at all you ought to read this book. If you are related to a creative, work or live with a creative or are even just friends with a creative this book will make your life a lot easier. If you are a creative you need this book as soon as you can get a hold of it. At this point I’d like to clarify what I mean by a creative. I mean the type of person sho creates artistic works and has a lot of the associated stereotypical things we’ve come to associate with creative people like mood swings, apparent laziness,the insistence to work stupidly long hours once in the flow of their work etc. It really was that good. I found myself absorbed in the book from start to finish and it has already impacted not just the way I see myself but also the way I interact with all the different creatives in my life. The first few chapters just talk about the creative person. How they appear and why they appear that way. The 5th chapter deals with all the negative things that can affect the creative mind and make them appear to be crazy, egotistical maniacs. Chapters 6-9 talk to the people in the world around creatives, starting with partners and parents, then friends, and finally bosses and leaders in the creatives life. The final chapter deals with keeping the creative person anchored and the role spirituality takes in that. The two writer’s, Jeff and Julie Crabtree, do an amazing job of explaining what is going on in the creative mind in an informative manner without making the creative feel like they are being boxed and defined. They also do a very good job of guiding people who don’t think this specific way through the intricate workings of the creative mind and how to help it when it isn’t working right. Personally my favourite chapter was actually the chapter on leaders dealing with creative minds. They laid out the best ways to get productivity and happiness out of the creative people in a work situation and not only did I find this really useful in terms of running companies that employ creative people but also from my own experiences working for people that really did not understand the creative persona at all. For me the book was a must and I really really recommend people read it as soon as they can. At the moment the book is only available on their website here. It should be coming to Amazon and places like that soon though and I will post again and link to them when it does. One of my friends recently introduced me and my husband to the game rockband. We had played it a little before now but only the odd few songs here and there and only one version of the game, where you often run out of songs you know in the first hour of playing. It’s fun for a little while but conversation soon moves on to other things. However, this particular friend had all of the games as well as many downloaded extra tracks, I believe somewhere over 400 songs in total. One hour soon turned into several, we even then came back the next day. To be fair, I’m not entirely suprised, my husband is a drummer and our house is litered with instruments we’ve both played/currently play. Several weeks later we’d arranged to have an entire friday night of it, we then spent roughly 6 hours playing rockband. At this point we knew we were obsessed. 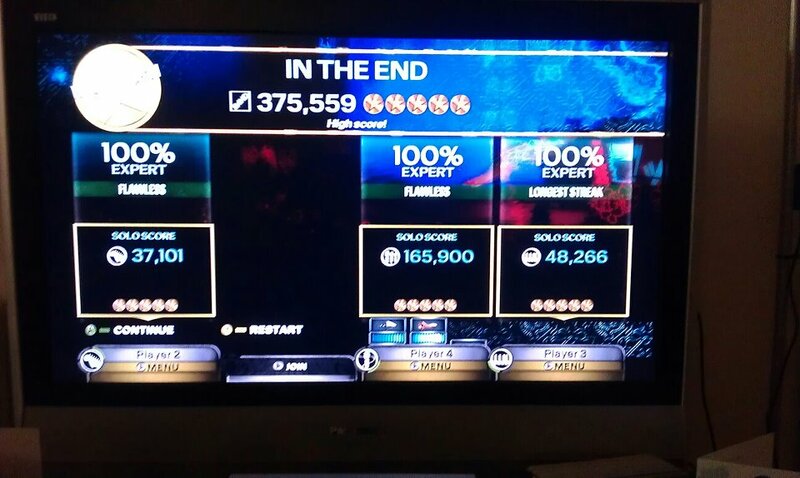 The hard work has paid off, however, the 4 of us that played it the most managed our best performance to date, Linkin park’s In The End, all on expert and with the backing vocals turned off. On the keys we had my lovely husband, Philip Mountifield, on the guitar we had the amazing Nathan Boxall, and harmonising the vocals was the lyrical artist Alex Feltham and of course myself. It was just such a shame that we had forgotten to sign in and our scores were not recorded.